Allez pêcher le saumon depuis Ketchikan pour une expérience de pêche exceptionnelle lors de votre visite en Alaska. Votre guide de pêche fournit les instructions et tout le matériel de pêche nécessaire à votre excursion du matin ou de l'après-midi. Selon la période de l'année de votre visite, vous pourrez pêcher le saumon royal, le saumon rose ou le saumon coho dans ce qui est réputé pour être l'un des meilleurs lieux de pêche au monde. 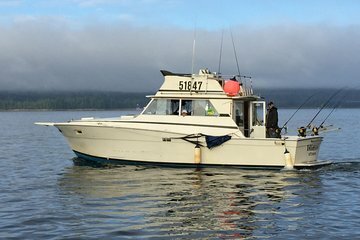 Comprend un guide, l’utilisation du matériel de pêche, ainsi que le ramassage et le débarquement au port de croisière de Ketchikan ou à votre hôtel. I went on this tour on Aug. 21, 2018, with five women friends. It was a beautiful day and we caught eight salmon. We enjoyed being with each other but we were quite disappointed with the chauvinist captain, Bob, of the shipping vessel, Sandi. He would not repeat any instructions and was rude and belligerent towards my friends and me. For example, when a fish got away as one of us reeled it in he yelled at us that we were handling the pole incorrectly and did not try to show us the correct way, because he had already showed us once and we should have listened. Another instance was when one of the women felt squeamish holding the salmon she had just caught he threw it to the ship's deck at her feet. He may have been very knowledgeable about his craft but he did not know how to work with those who weren't. Great excursion. All the kids on our trip voted it as #1! the boat was great.. 2 stories which was fun. The captain (the only female in the fleet) was great. She had cookies, and drink and other snacks. And she took care of having the fish shipped back to us! Very smooth trip from the time we got off the cruise ship until the time they dropped us back off . Tour started when we were picked up at our cruise ship dock without any hassle or waiting. My father-in-law, 15 year-old son and I had a fantastic experience with Captain Brian. He was knowledgeable, friendly and extremely helpful. We caught many fish and the tour went by much too quickly because we were having such a great time. No down-sides, I highly recommend this experience! David S.